Hi! Barbara Washington here to share another card as SweetStamps guest designer for April. This week the SweetStamps challenge is Easter. I chose the SweetStamps image, Girl With Bunny, as my focal image. She is so adorable dressed in her Easter finest. She's even wearing her Easter bonnet. She is holding her little bunny and looks so happy. She was a perfect stamp to paper piece. Even the bunny is paper pieced. I used a soft paper towel for the bunny to give it a soft, furry look. I fussy cut the girl so I could layer her on top of the background. The yellow background panel was dry embossed using an embossing folder. I die cut the basket from wood paper. Then I layered die cut vines and added the little flowers with Viva Decor centers. The sentiment comes from another SweetStamps set, Black Capped Chickadees & Blessings. I love the fact that you can use this sentiment for more than just one holiday. There's still time to join in the challenge. Looking forward to seeing your creations! Your Easter card is so pretty Barbara! Love...love the paper piecing! Thank you for sharing this adorable creation! Loving this wonderful card- the image is darling- love the paper piecing on her dress. The die is fab and love the BG embossing! 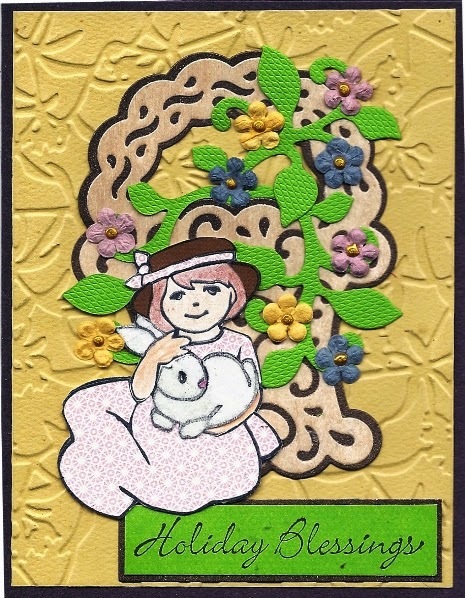 Beautiful Easter card, I love the paper piecing on the little girl. Thank you for joining us this month as our guest designer. Looking forward to seeing what you have in store for us. Adorable Easter card! Love the combination of the stamps and dies! !